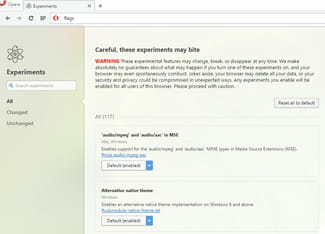 Opera features a secret Experiments page where the curious minded can test browser settings before they are released to the public. Warning: Some of these experiments, which are also referred to as flags, may cause your browser to behave abnormally (data loss, random crashes, and security issues). Enable the desired experiment(s) and then restart your web browser to apply the new settings. Published by jak58. Latest update on December 28, 2015 at 02:36 AM by jak58. This document, titled "How To Access and Enable Experimental Features in Opera," is available under the Creative Commons license. Any copy, reuse, or modification of the content should be sufficiently credited to CCM (https://ccm.net/).